Arriving in Marquartstein was a major milestone for me, as I was meeting my wife and seeing family there. Sabine was going to be walking with me for a while, and I was looking forward to the company. We ended up taking a few extra days off because everyone was ill. I was the only person who managed to avoid getting sick. We took it a bit easy once we set off, and made it to Bergen the first day. The daylight was getting shorter, and we were using most of it to reach our destination. We arrived in Bergen just in time for sunset. 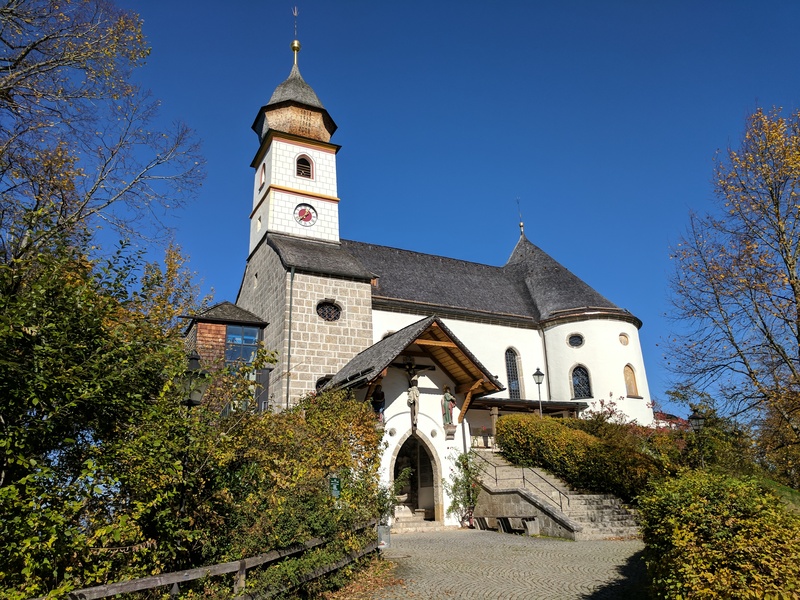 The second day was highlighted by the chapel and kloster of Maria Eck, the cross-country skiing center of Ruhpolding, and the village of Inzell. 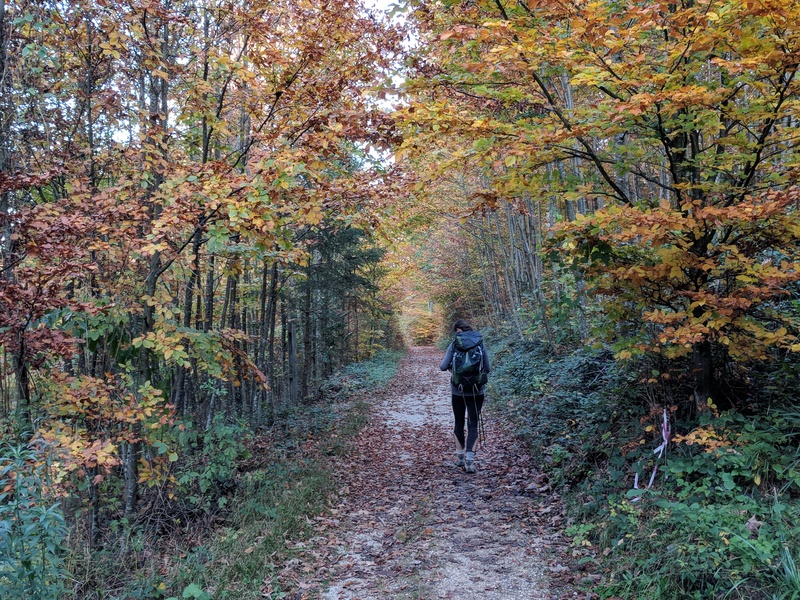 We were lucky to have good weather, and the Autumn colors were still around. If the village of Inzell sounds familiar, that is because Inzell is famous for speed skating. Max Aicher Arena is the base for the German olympic speed skating team. It plays host to world cup competitions every year, and the village is usually full of speed skaters from different countries. The way out of Inzell was supposed to include a high-mountain crossing, but we decided to go around since Sabine was still not feeling that well. 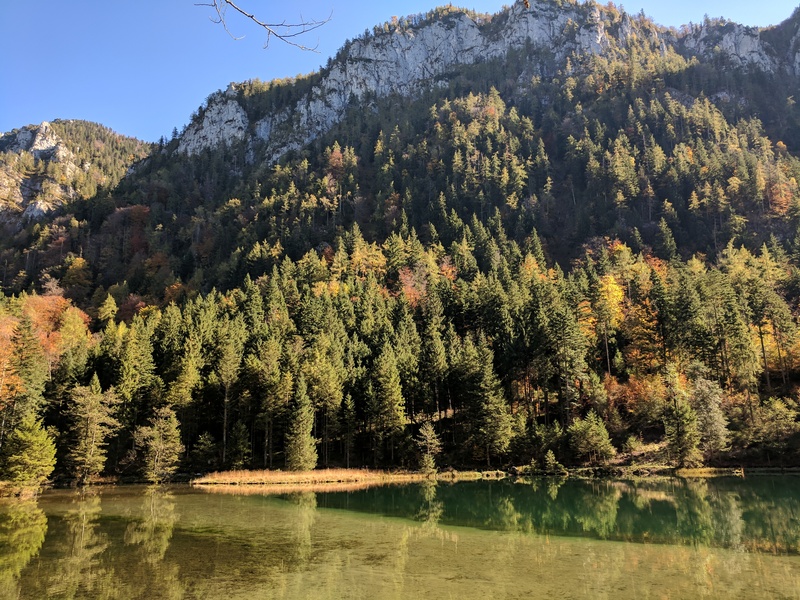 The walk around was through a beautiful valley, and the path passed near the glossy, clear Falkensee. 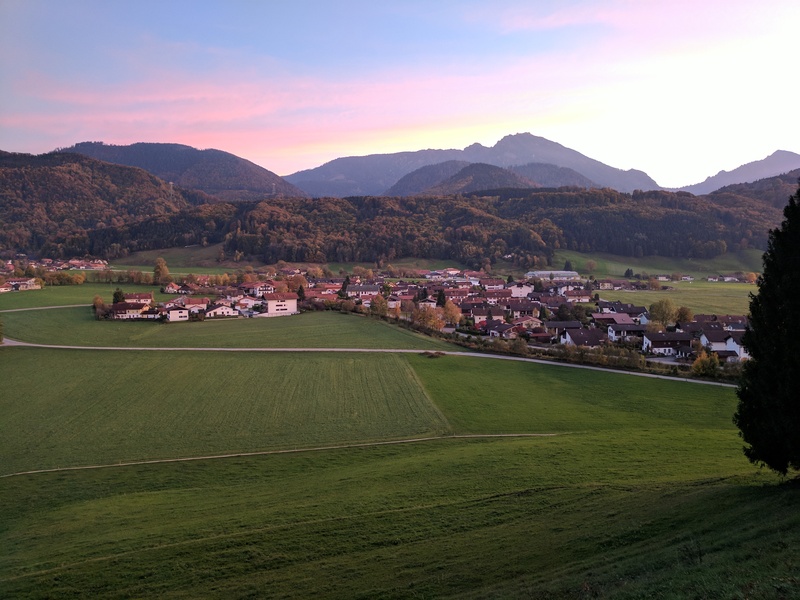 The day ended in Bad Reichenhall, which is a town built on salt. Millions of years ago the sea was covered by the earth, resulting in huge subterranean salt deposits that are extracted via the pumping of brine. The pink salt is widely sold as a specialty food item. 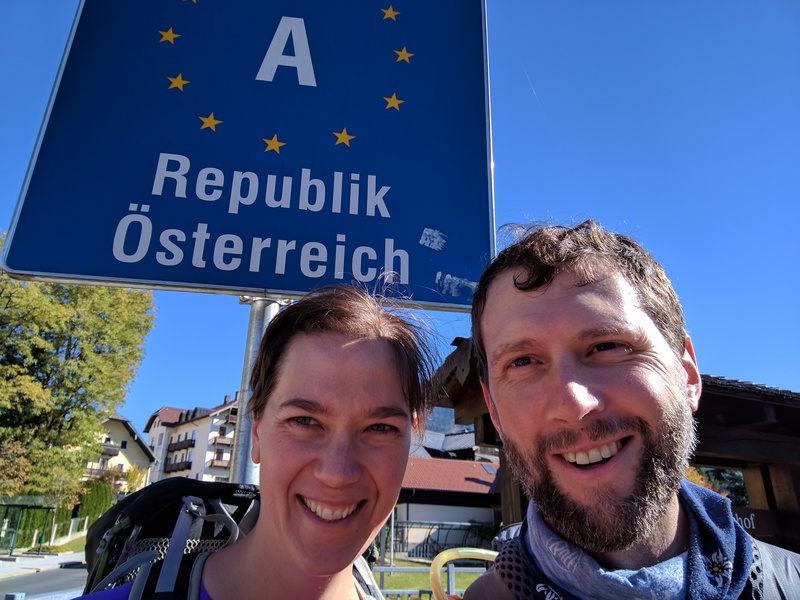 Only a few kilometers out of Bad Reichenhall was the Austrian border, marking the end of our time in Germany. After crossing the border in Grossgmain, the rest of the day was not very attractive as it was largely suburban buildup heading into Salzburg. 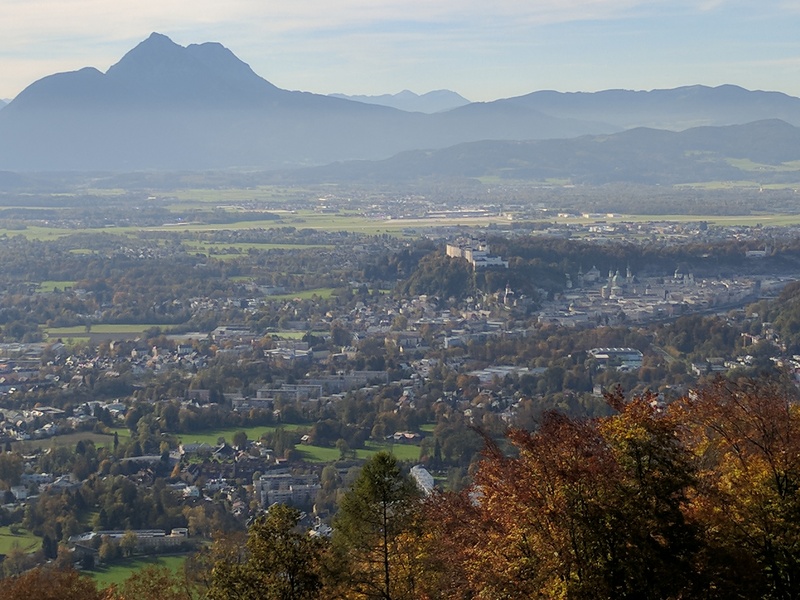 However, Salzburg itself is really a special city. 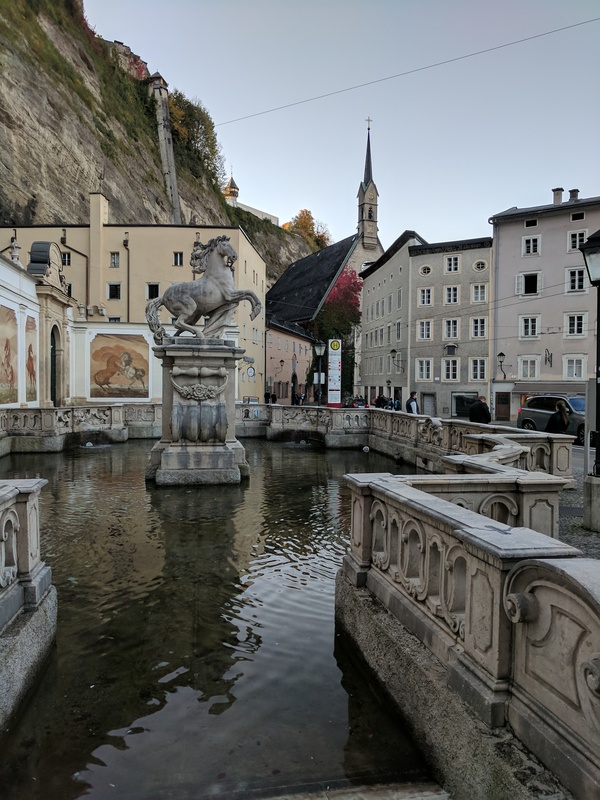 I have been to Salzburg several times, and it remains one of my favorite cities. It is a cultural capital with interesting architecture and lots of sights. In the morning, we left the city by climbing up and over the Kapuzinerberg. The hills beyond the city provided some unique views back to Salzburg. 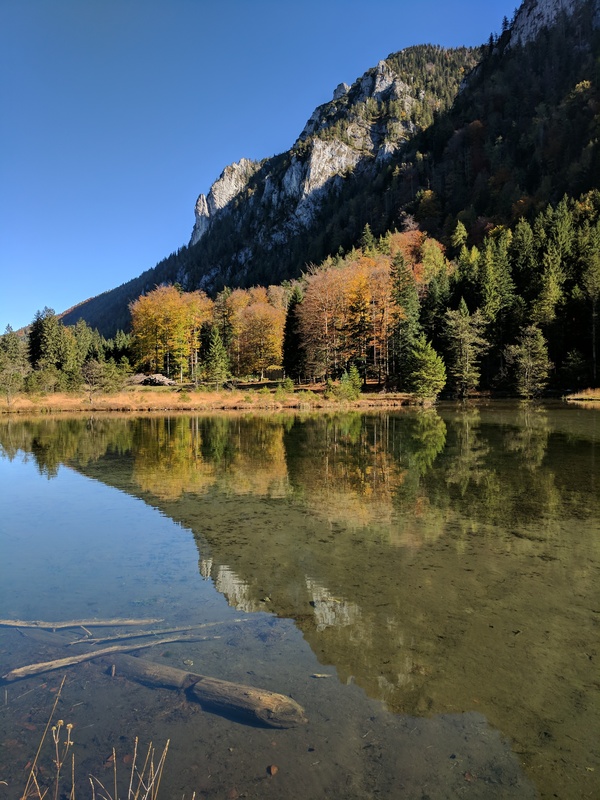 The following day marked our arrival in the Salzkammergut lake district, emerging from the hills to the shore of the Fuschlsee. 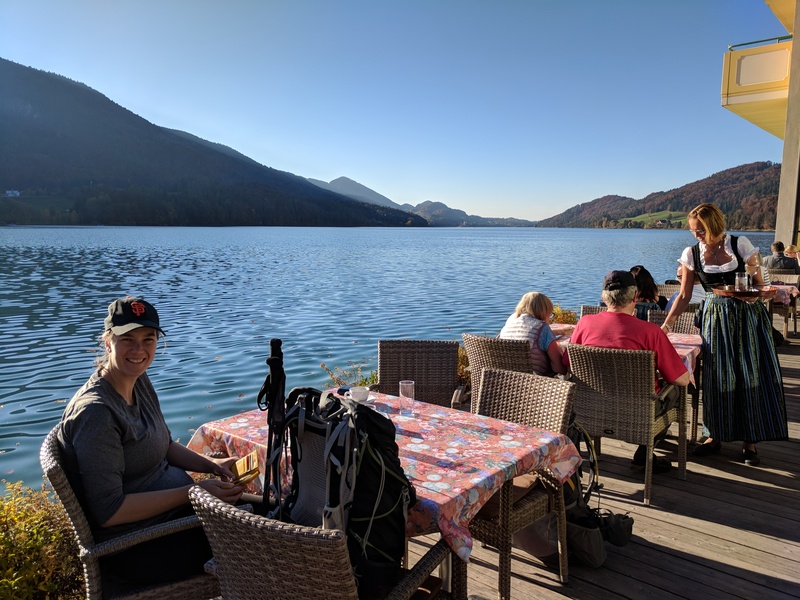 We took a coffee break there before continuing on to the village of Sankt Gilgen on the Wolfgangsee. 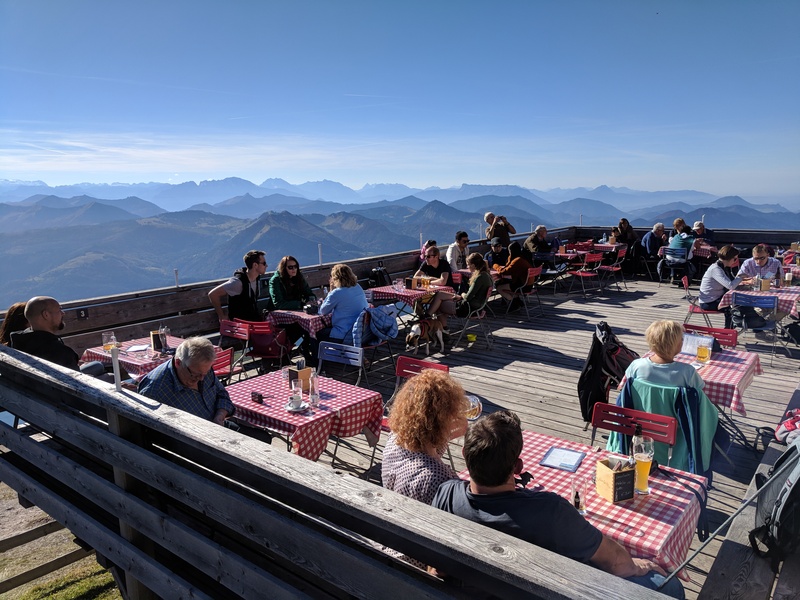 Sabine was feeling a bit better the next day, and since the weather was great we decided to complete the Schafbergspitze climb. This was the most spectacular day of our walk together. It was a tough climb for hours, but the views were well worth it. 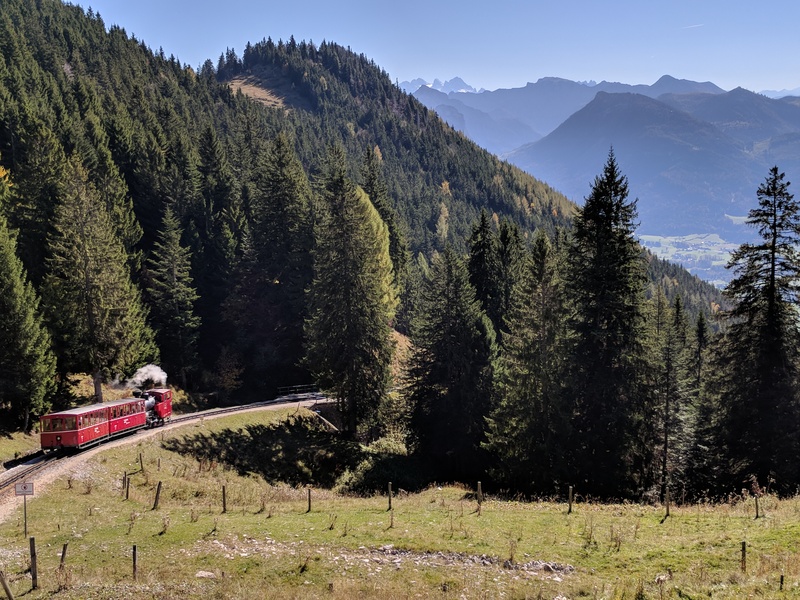 There is an alpine railway line that snakes its way to the top, which is a really amazing piece of engineering. 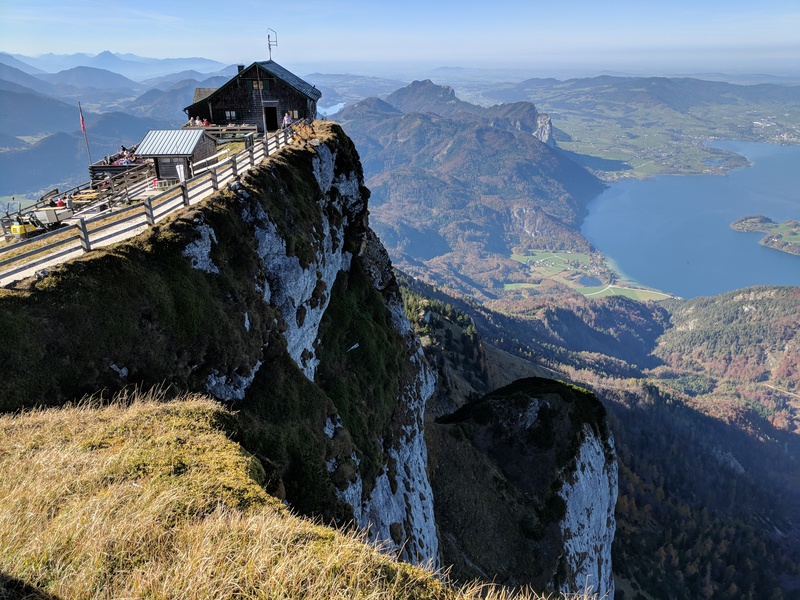 At the top, there was a small restaurant balanced on the edge of the cliff. 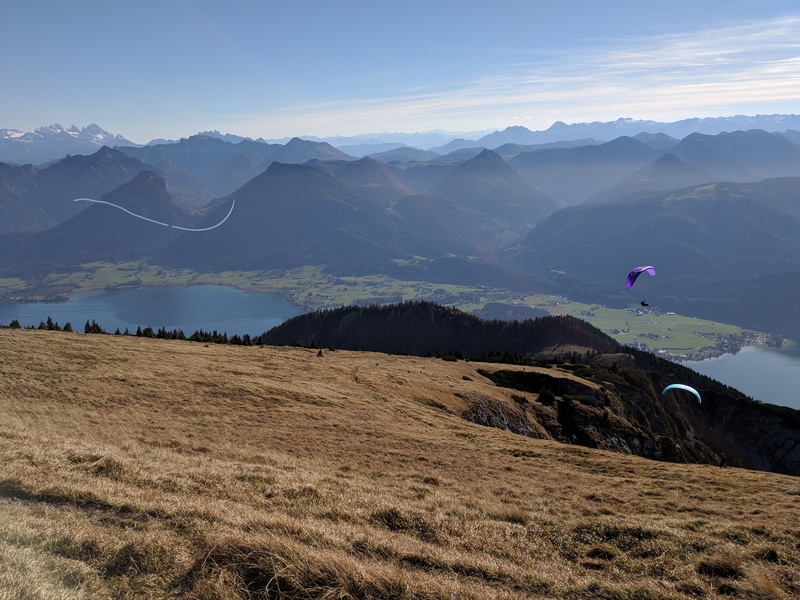 As we were leaving the peak, several paragliders were launching and a stunt pilot was flying in the valley below. The descent from the peak was steep and a bit sketchy. There were some cabled sections that were not for the faint hearted. Sabine was not entirely happy with this section, but we made it through. We ended up running out of daylight, and had to walk the last few kilometers in the dark using a mobile phone flashlight. We arrived in Weissenbach am Attersee late, but the guest house owner still cooked a hot dinner for us, which was nice. The next section went over some high mountains, and we were not feeling comfortable with it given our darkness venture the night before. 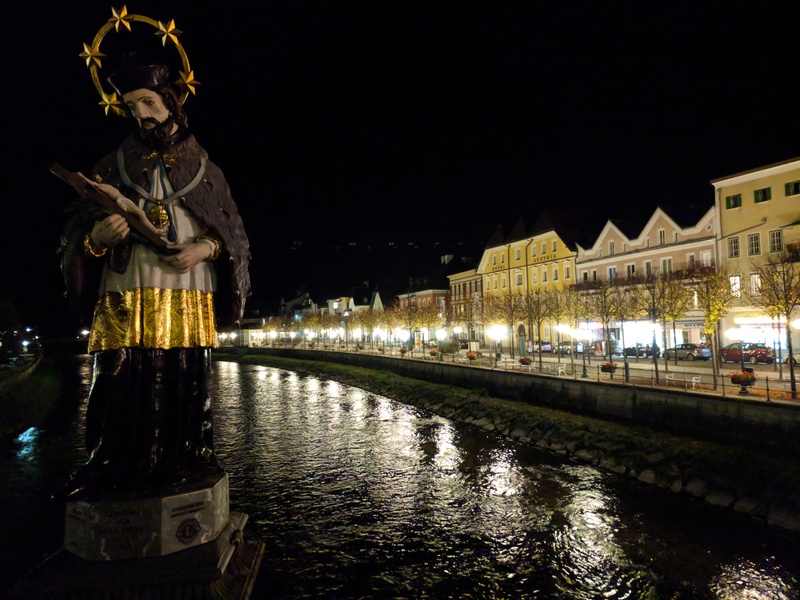 We decided to cut across to the town of Bad Ischl. The trail through the hills was not very well maintained and it was a bit of a slog to the top, followed by a descent that was made more difficult by the poor trail. 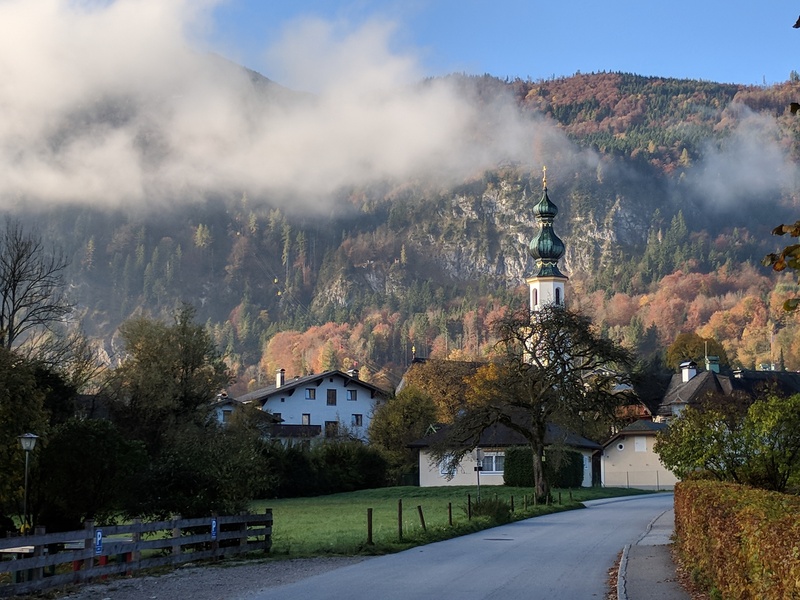 We eventually reached the valley outside of Bad Ischl and were able to speed up for the final piece into town. 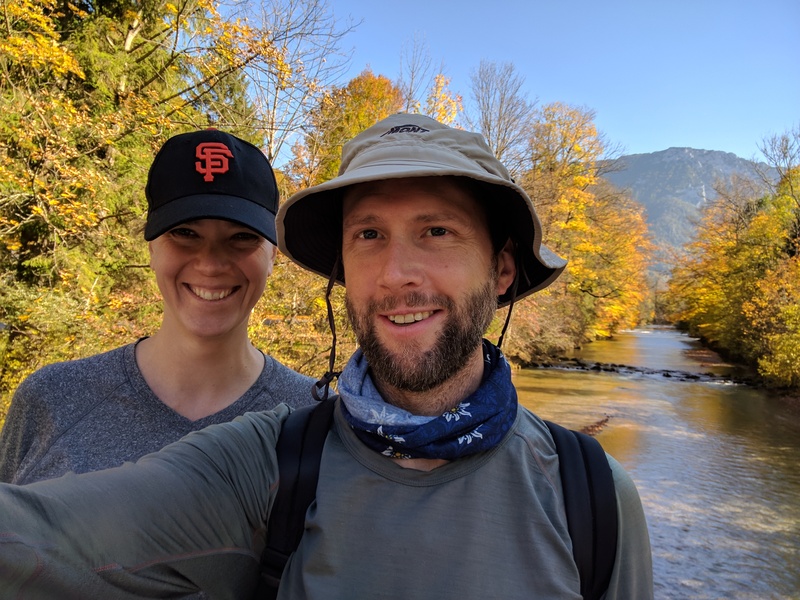 Our last day together was spent following the valley from Bad Ischl to Ebensee. The weather was not very good, with periodic drizzle and rain. The scenery was also not particularly attractive on this last day, but it felt good to reach our goal. Took a rest day before saying goodbye and having to continue on my own again. That seemed strange, even though I had done most of the walk alone.